The Bogen HS30EZ is a compact, high intelligibility, reentrant type loudspeaker designed for use with 70V amplifier systems. 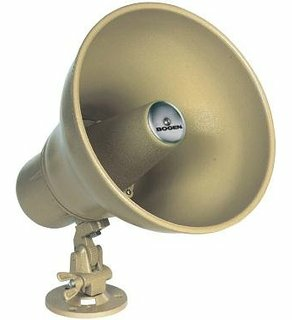 It is a 30 watt single-tap speaker that includes a stepped attenuator volume control and comes with a tilt and swivel mounting base for setting the angle of projection. The HS30EZ also features a sturdy, weatherproof, all-metal construction that is ideal for indoor and outdoor use in industrial plants, warehouses, schools, construction sites, transportation terminals, and recreational areas.